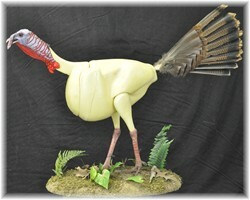 World Champion, Brett DeFreitas, began his quest for designing and producing an easier, more anatomically correct turkey form in 2008. It was a journey that required a lot of research, attention to detail, sculpting, mounting, revisions, passion, and determination. Finally, 2 years after he began, Brett has developed and received his copyrights to begin selling Boondocks BAD Boy Turkey Bodies and its components. 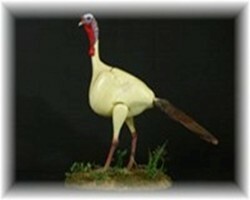 We, at Boondocks Taxidermy, believe these are the most accurate, anatomically-correct turkey forms available in the taxidermy industry. 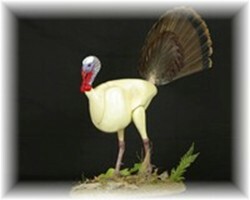 Please take a look at the testimonials from other taxidermists to see what they think of Boondocks BAD Boy Turkey Bodies and check out the awards page to see how these bodies have done in competitions. 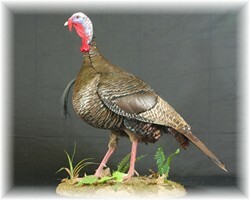 Boondocks BAD Boy Turkey Bodies will allow the taxidermist using them to mount a more beautiful, natural-looking turkey with less stress and time, thus improving the taxidermist's confidence and enjoyment when he begins working on his/her turkeys whether for a customer or for a competition. 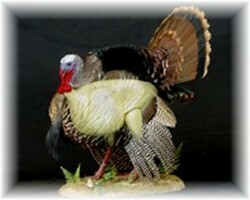 Our turkey bodies come in 5 sizes for a great fit and a hen body. Please see chart below for sizing information and prices. We also have neck inserts (please specify size of body when ordering) and drumsticks available. Of course, our freeze-dried turkey heads complete the mounting system wonderfully with all parts fitting together as they should. 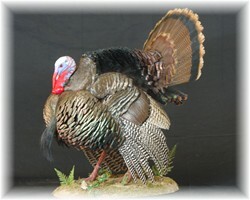 We appreciate your interest in Boondocks BAD Boy Turkey Bodies and hope to do business with you soon.